A Seafood Boil Bucket at Jetty at the Port. The restaurant recently made changes to the menu to transition to a casual, beachy feel. 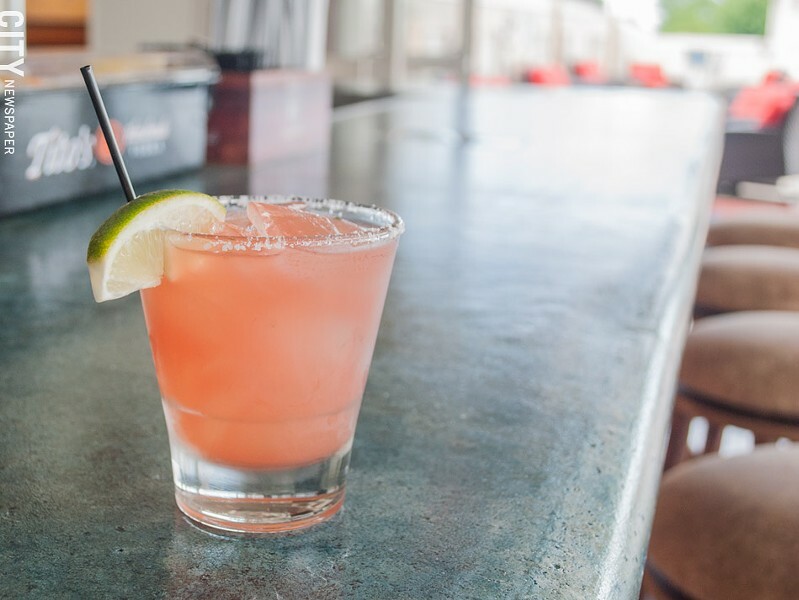 Jetty at the Port (1000 North River Street) in Charlotte has already been open for two summers, but recently, changes have been made both aesthetically and to the menu that have transitioned the establishment from fine dining to a more casual, beachy feel. Jetty at the Port is owned by Craig Ristuccia, who also owns Hose 22 Firehouse Grill, and overseen by operations director Erik Sorensen. "We're trying to bring it up from just a foot traffic location to a destination you would travel to," says Sorensen. 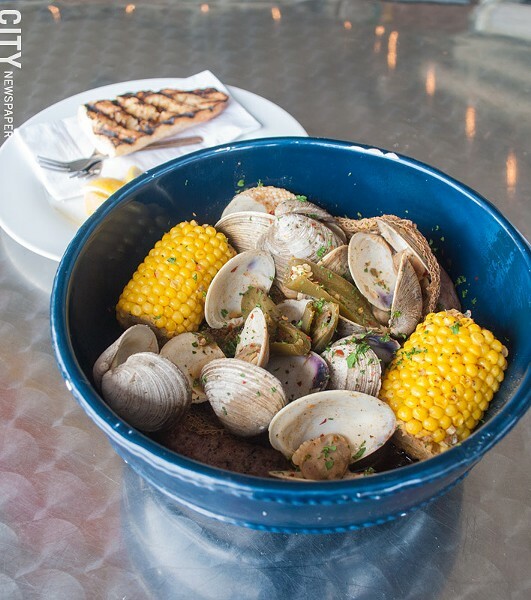 Sorensen grew up in the Mid-Atlantic region and drew inspiration from the popular restaurant chain Chickie's & Pete's when it came to updating the menu at Jetty at the Port — specifically, the Seafood Boil Bucket ($19-$36). "I thought that was really cool," Sorensen says, "there's nothing really like that up here — there's seafood places that are more fine dining, but there's not like a 'put a bib on and get dirty with your seafood' kind of place. We wanted to bring that experience here." All of the boils include a pound of steamed seafood (your choice of mussels, clams, or snow crab), Italian sausage, salt potatoes, and corn on the cob, and can be served with your choice of sauce. The house "Creole" beer broil sauce is made with Samuel Adams Summer Ale and Creole spices that add a kick of heat. The restaurant is located in the Port Terminal Building and boasts a giant patio with seating capacity for nearly 180 people. There's also a bar and lounge area. Walls were knocked down and replaced with garage doors, offering more of a flow between outside and inside. 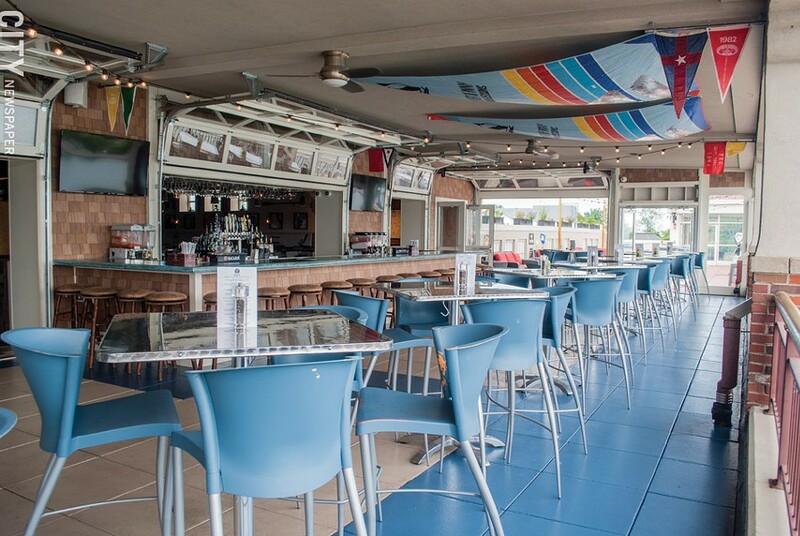 The bar now extends outdoors as well, enhancing the beachy feel. "We changed the focus from a restaurant with a bar to a bar with a restaurant," Sorensen says. "We wanted to do something a little more casual, a little more laid back." Flip-flops and beach shorts are welcomed here. The beach vibe extends to the bar program, where you can order a Strawberry Daiquiri or a Basil Bourbon Iced Tea, made with house-made, basil-infused, iced black tea and Jack Daniel's Honey Bourbon. Happy hour is from 11:30 a.m. to 6 p.m., Tuesday through Friday; 11:30 a.m. to 5 p.m. on Saturday; and all day Sunday. Specials include $2 off all frozen drinks and buckets of beer. On Sundays, you'll find $3 Mimosas and $5 Bloody Marys. Jetty at the Port (1000 North River Street) is open Sunday from 11:30 a.m. to 9 p.m.; Tuesday through Thursday, 11:30 a.m. to 9 p.m.; and Friday and Saturday from 11:30 a.m. to 10 p.m. 621-2000; jettyattheport.com. WXXI will premiere a new TV series, "Brewed in New York," on Thursday, July 5, at 5 p.m. The first episode in the 13-part series will focus on Rochester breweries Genesee, Three Heads, and Swiftwater. More information at brewedinnewyorkshow.com. If you missed the first Midtown EATS, fear not — the event comes back Thursday, June 28, July 12 and July 26, and August 9 and August 23. Vendors serve lunch from 11:30 a.m. to 1:30 p.m. and dinner from 5 p.m. to 9 p.m. All dates are rain or shine and take place at the pedestrian walkway that connects Broad Street and Elm Street, next to Tower280. Parking is free during event hours in the Midtown Garage. More information at midtownEatsROC.com. Following up on our DISH guide to local food tours, Flower City Food Tours has added two new tours to the roster. Thursday's Park Ave: Shortest Distance to Walk Food Tour was developed for those that wanted less time on their feet (only two blocks) and stops at The Mad Hatter, Parkleigh, and The Red Fern. The other new tour, Early Evening: Tastings & Tapas tour in The Neighborhood of the Arts takes place on Thursdays and Fridays from 4 p.m. to 7 p.m. and includes stops at seven locations in search of the happiest hours. Tickets must be purchased in advance and can be found at flowercityfoodtours.com. Next Door Bar & Grill (3220 Monroe Avenue) now offers Omakase for $45 per person on Thursday nights at 6 p.m. at the Sushi Bar. Omakase translates to "I'll leave it up to you" in Japanese and Next Door's features a chef-designed, four-course sushi tasting menu. Reservations are required. More information at wegmansnextdoor.com. Juicy Seafood has opened at 3020 South Winton Road.